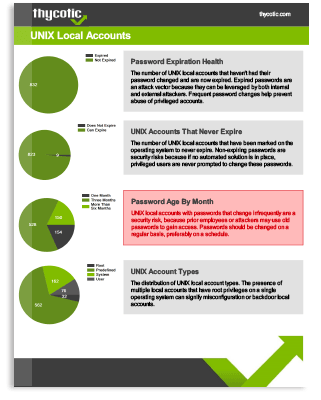 Unix privileged accounts such as root admin accounts provide substantial power and access to IT systems, yet often lack the security necessary to protect against malware attacks and malicious insiders. Once a hacker or malicious insider has taken over a Unix root admin account, its powerful features allow unfettered access to IT systems that can remain undetected for several months. Thycotic provides comprehensive Privileged Access Management and Security solutions that secure privileged Unix account passwords and enforce a least privilege strategy on these accounts. Privileged Unix accounts are a concern for auditors because of their enormous power and simultaneous lack of access control and accountability. In UNIX and Linux, privilege can be established two ways: by using a root account that is a full-access pass on the network, or by using a limited user account and adding sudo access commands as needed to perform specific privileged tasks. Both of these methods present security and compliance issues around managing who has access across multiple UNIX/Linux systems, and also controlling the use of the root accounts. Implementing identity access management on Unix can be difficult because either a federated identity system or a bridge to AD is needed to allow the mapping of AD accounts to Unix identities. Some administrators will attempt to manually manage unlinked user accounts per user across multiple Unix environments, or use a synchronization or provisioning tool to do so. Other teams may use generic shared accounts and then control privileged access to those shared accounts. Either way, the solution needs to be manageable and provide irrefutable accountability for who is using the system and what they are doing. Root accounts are the most powerful accounts on a Unix system and without a root management and security tool to bring accountability, organizations face several security and compliance risks. Ideally, the use of Unix root accounts should be limited and utilities such as sudo are in place to raise privilege while keeping the user accountable. In the case of shared accounts, as well as for certain configuration changes, root access is still required. Access to both sudo and the root password need to be controlled, and only one individual should know a password at any point in time to ensure there is accountability for any actions taken using the account. These accounts should also have their passwords rotated on a regular basis to prevent any brute force attacks aimed at hacking passwords. Thycotic Secret Server enables IT teams to control and monitor who has access to each privileged credential on the network. Secret Server includes automatic password rotation, password length and complexity enforcement, and full accountability through user audit trails and advanced access and oversight controls. The Unix Protection adds whitelisting for Unix commands to protect Unix systems from unsafe or unauthorized commands. Unix Protection is Thycotic’s privileged access management software that enhances Secret Server security by enforcing a least privilege strategy. Unix Protection enables administrators to build a Unix command whitelist that limits what users can do with root admin privileged accounts. Increases security with granular control of root credentials to limit privileges while meeting compliance regulations and policies for Unix Superuser Privilege Management (SUPM). Generates reports on what commands users can run to demonstrate compliance for auditors. SSH command whitelisting allows admins to log in as root, but only gives them access to a set of predefined commands. For example IT administrators might be able to restart the database and read log files, but not reset user passwords. Thycotic Unix Protection provides an integrated Secret Server security solution that enables you to control and monitor the commands superusers can run based on their role and required tasks. Minimizes the use of privileged rights and enforces least privilege policies for super user rights. Replaces siloed unix sudo commands with an enterprise-ready, scalable security solution with audit capabilities. Restricts commands based on defined policies and limited super user permissions, reducing the risk of misuse, abuse or accidental error. Ensure privileged accounts are more secure by enforcing least privilege policies for Unix superuser accounts without impacting their productivity. Minimize the risk of data breaches and insider abuse associated with unauthorized access to, or escalated privileges of, Unix super-user accounts.